My on-the-road husband did show up at last, ending my week alone and a good thing too. 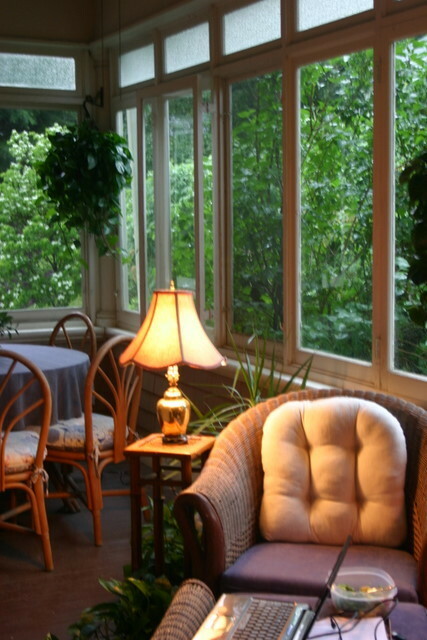 I’d begun hanging curtains on the screened-in porch – curtains on a porch! – but at 108 inches per panel , they’re a little LONG for the purpose and so sort of melt and swirl about on the porch floor like the hemlines of a gathering of ghosts. Of course I realized their excessive length only after whanging a bunch of nails and screwing a bunch of screws along the whole 30-foot length of wall out there to get the curtain rods in place so now I will have to take down and cut the curtains, hem the curtains, RE-IRON the curtains and then hang them again using the cute new bought-for-the-purpose stepladder that looks like a jaunty four-foot-tall upper case A when in use, then magically sandwiches itself shut again to turn into a kind of a Flat Stanley of aluminum, skinny enough to store behind any door. And I know some might say you don’t actually NEED curtains on a screened-in porch. It’s what Old Dave said the second he saw them. Actually he said one word, “No,” which after all these years of marriage I take as a sign from God herself that I should press on. I mean I know curtains on a porch may seem weird since the whole idea of a screened-in porch is to let the breezes in. But this porch has a high set of windows above the screen that I find sort of questionable looking and that also force our nice new neighbors to have to look at me out there in my trusty blue nightie 7am, sucking in coffee and tapping madly on my keyboard. Why wouldn’t I want to spare them that sight if I could? Also – and they don’t know this because they just hot here two months ago – this paradise of palm trees and fern fronds gives way to a very different sight come winter, when Old Dave takes every stick of outdoor furniture we own including the wicker chairs on the three real front porch and stuffs them in practically on top of and in some cases actually on top of all the furniture already living there. Then the place looks like a warehouse. For years I have felt terrible about this; about the way our former neighbor had to look over from her house and see this mess. I even, mentioned it to her once. “That’s the least of my problems,” she said which I took to mean it was, in fact, a problem, or anyway an eyesore. Ever since, porch curtains have been on my mind and now I’m just making them, whatever David thinks. I’m going to let them drape to the floor, then gather them up in my arms, flip them over the rod and tug at them until they scallop and fluff like Scarlett O’Hara’s petticoats. It will be nice! He’ll see! Maybe I can take a picture and post it here when I get them all up, though I expect my progress might slow down now that he’s back and I can be calm and normal again. Anyway they were so cheap. 75% off! I got ‘em at Macy’s during their Super Special Sale Days and then when I pulled out my pocketful of promotional coupons. I saw I couldn’t afford NOT to buy ‘em. Well, just like Scarlett, maybe you’ll need them as bandages if Old Dave escalates beyond “NO”! !… for him, of course! !